Although we like to surprise our customers and have your order posted within 1-3 working days, it may take up to 10 days to complete. During peak periods such Mother’s Day or Christmas, your order may take 1-2 weeks. If you require your order to be sent earlier, please send a message through via the CONTACT US TAB before placing an order so that I can make sure your order can be processed, created and posted in time. Where is three angels boutique located? Your sentimental piece is hand stamped by hand and hammer and/or laser engraved right here in Canberra, Australia. We do not outsource our work overseas or elsewhere; instead we personalise your keepsake piece ourselves. This way we can guarantee you full customer service and satisfaction. Plus we just love doing it! Can you tell me about the metals you use? You can read more about our metals under PRODUCT INFORMATION but in short, our metals have been selected to provide a special keepsake that will not tarnish or erode over time. 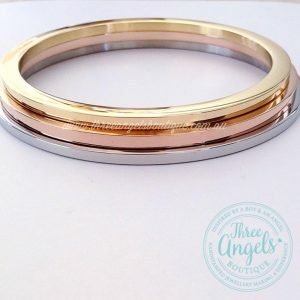 Three Angels Boutique understands that your hand stamped and/or laser engraved piece contains special meaning to you, and we want your sentimental piece from Three Angels Boutique to last forever. That’s fantastic! I look forward to working with you to create your vision. Three Angels Boutique is always happy to discuss what you are after, and if we can make it, we will! Just send an email via the CONTACT US TAB or contact through our FACEBOOK page. Looking forward to creating your keepsake piece. What fonts can i choose from for hand stamped pieces? Sculptor is the most popular 3mm font, suiting pieces for both males and females perfectly. Scarlett’s Signature is a 3mm font that is perfect for pieces for children as its a bit fun, but easy to read. Small Block is 1.5mm in height, and is a popular classic font that is easy to read although small. Margarita is our latest 3mm font that is more unique, and puts a twist on letters. I have a unique design in mind that I can’t find on the website. Can I have it created? Yes! We would love to hear from you and discuss your idea! We don’t want to promise the world, but we will promise to give it our best shot and work with you to design and create a piece that it completely unique to you. Just send us an email via our CONTACT US page and let’s talk! As all items are custom personalised as per your specifications and created just for you, we do not offer returns or exchanges due to change of mind or incorrect inscription instructions. However, if we have made a mistake with inscription or if your item is faulty; we will gladly remake your order for you where possible. In the event that a piece if no longer available, we will provide an exchange or refund. All refunds and exchanges are at the discretion of the owner of Three Angels Boutique, and your statutory rights will be upheld.